Dentures are removable appliances that replace missing teeth and help restore your smile. If you’ve lost all of your natural teeth, whether from gum disease, tooth decay or injury, replacing missing teeth will benefit your appearance and your health. That’s because dentures make it easier to eat and speak better than you could without teeth. When you lose all of your teeth, facial muscles often sag which can make you look older. Dentures can make you feel and look better! 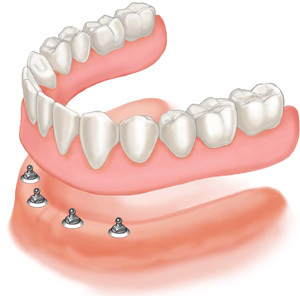 A partial denture or bridge is a removable device with replacement teeth attached to a pink base. A metal framework holds the denture in place in the mouth.